The Albuquerque River of Lights has provided sparkling fun to the holiday season since 1997. Since its induction, volunteers continuous create new sculptures to add to the dazzling light displays found throughout Albuquerque's Botanic Gardens. 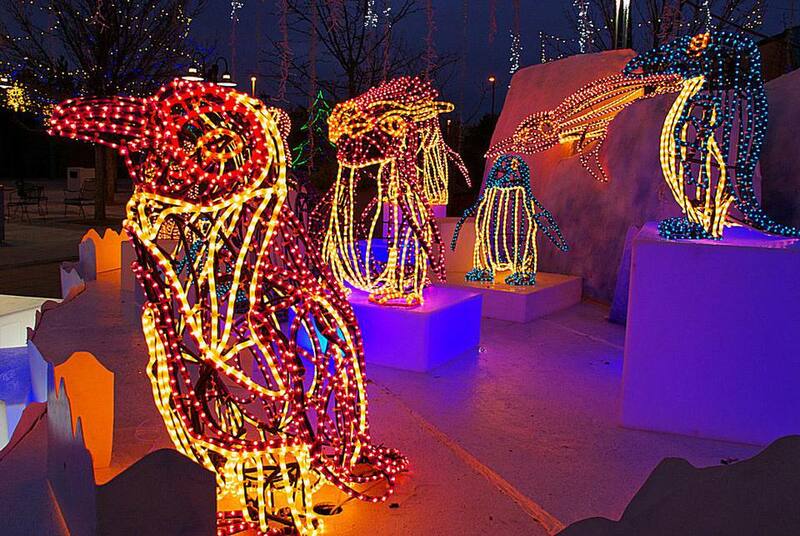 Watch running animals, twirling snowmen, Snoopy Santa on the garden train, and much more, as there are over 400 light sculptures that keep glowing and growing every year. Tickets for Rivers of Lights can be purchased starting in November from any ABQ BioPark cashier during garden regular hours or online. Group discounts are available for groups of 50 or more. The River of Lights provides a magical place to enjoy the holiday season. In addition to the light sculptures which visitors can walk through, you'll find carolers and singers, a snowman display house, and the chance to have Supper with Santa. With so many on display, you will undoubtedly see animated, 2D, 3D, even life-sized and moving lights. From cactus and yucca to spiders, birds, zoo animals, and trucks, the displays expand every year, so there's always a reason to come back again. Live entertainment takes place each night and can include carolers, musicians and more. A special holiday G-scale model train runs from near the entrance to the Botanic Gardens to the Butterfly Pavilion, and be on the lookout for Snoopy Santa! On several weekends, the Rio Train Line provides a special experience. Passengers board the train at the Botanic Garden/Aquarium lot. As the train chugs through the Botanic Garden, you will sip hot cocoa as you enjoy a story and fun holiday music. Santa and his elves greet children in the train and give them a special gift, and after getting off the train, passengers can enjoy the River of Lights. Polar Bear Express tickets can only be purchased online and in advance. Get them immediately, as they sell out fast. Tickets are date specific and only valid for the date purchased. Dress warmly, and in layers. Once the sun sets, it gets chilly, and wandering the gardens is primarily an outdoor affair. Bring hats, gloves, mittens, and scarves. River of Lights is busiest closer to Christmas, and on weekends. Consider visiting on a Monday or Tuesday, when the traffic is light. Bring something the young ones can rest in, whether that is a stroller or wagon, as well as a blanket to keep them warm. If you forget to bring your own, wagons are available for rent at the entryway. Wheelchairs are also available on a first-come, first-served basis at the Shark Reef Cafe, and require presenting a driver's license. Bike racks are available at the entryway to keep your bicycle secure. If you'll be taking the Polar Bear Express, be sure to allow extra time for traffic, parking and walking to the train. Remember, the tickets are non-transferable and non-refundable. The model trains will be running Wednesdays through Sundays from 6 p.m. to 8:30 p.m., weather and staff permitting. Look for Snoopy Santa on the holiday train. There will be other food for sale at the gardens as well. There will be Holiday Nature Crafts on Wednesdays from 6 p.m to 7:30 p.m. Visit the education building December 7, 14 or 21 and create some holiday presents. The Garden and Aquarium gift shops are open during River of Lights. Parking is free and there are always spaces at the Botanic Gardens lot. On busy nights, the lots by the Heritage Farm and Tingley Beach are used for overflow. Enjoy this free service on select nights and beat the traffic snarl. Note: Park and Ride is not wheelchair accessible. Accessible parking can be found at the Aquarium/Botanic Garden parking lots. The Park and Ride is available Friday and Saturday nights and is closed on Christmas Eve and Christmas day.